Brantley Lake State Park – Let's Go RVing! We had a restful and quiet weekend – kind of! Being in a motor home in a high wind advisory is not quiet! In fact we had to pull in two of the slides Saturday night and we were rocking all night. It was not a particularly restful night to say the least. Jerry had said that he wanted to get an early start to Carlsbad on Sunday morning so I got on up around 7:00. The wind was still blowing, the wind advisory was still in effect and we were still rocking. I was never afraid of turning over but I was worried about the toppers on our slides plus I didn’t know if the wind could knock our slides out of alignment. Jerry did not get up so I began to think he might have alternate plans. He did. When he finally got up he said that he just didn’t think it was safe to be on the road in an RV with 35+ mile winds. I had already told him that RVer’s often changed their plans due to wind. We decided to stay an extra day in Fort Davis. Jerry saw the owner of the park and paid for an extra night as had some others in the park. In the meantime we decided it was a good time to wash the linens and do some cleaning in the coach. Also I began the process of trying to change our reservations at Brantley Lake State Park in Carlsbad, New Mexico. This is the first time that I have dealt with Reserve America and it will probably be my last. In fact, I’m about to the point of not making reservations anymore! I called the park and left a message. By early afternoon no one had returned my call so I called again. The gentleman who answered the phone said he was new and really didn’t know but he’d check it out and get back to me. He did and just told me that I had to go through Reserve America. I went on the web site and because it was the day of arrival my only choice was to cancel the reservation. I couldn’t change it and there were a couple of fees involved with my getting a total refund of $13. We finally decided to heck with it. We’d just lose the Sunday night reservation and get up early Monday and stay there Monday night. That meant changing our reservation in Amarillo and Caprock so finally I just said let’s get up real early, be on the road no later than 8:00 and get to Carlsbad, see the caverns, spend one night and be on our way so that is what we decided to do. With that settled we spent the rest of day watching football and updating the blog. Around mid-afternoon the wind finally died down but it was too late to leave plus we had paid for the night. I took a short walk around the park just to get out a bit. Although it’s a small park I saw rigs from as far away as Alaska. I thought we were a long way from home! We got up early Monday morning and were pulling out of the park by 7:55. Probably a record for us. On the way we saw several oil rigs and noticed that there was a burn ban in effect. Everywhere we looked was brown grass and we saw a lot of irrigation systems. There were also more cows than we’ve seen anywhere else. We stopped at a Stripes station outside of Pecos for gas. I have never been to a more congested station. Lots of big trucks, small trucks, a few cars, truck with trailers. We saw that we could get in easily so decided to try it. Probably should have done off route 3 miles to the Flying J as several empty cars indicated that you had to go inside the station – pretty much of a mess! We got to Brantley Lake State Park around noon but had a little trouble finding our site. Since we were supposed to come in yesterday the park ranger did not have our information and I couldn’t get the confirmation e-mail to download. We finally got it straight and quickly set up, ate a sandwich then off to Carlsbad Caverns we went. Somewhere I heard that the caverns were 24 miles away but it was more like 40. Had I known that I probably would not have chosen to stay at the park but in riding to the caverns we both decided that I had probably made a good choice despite the distance involved. What can I say about Carlsbad Caverns that hasn’t already been said thousands of times? Simply put they are spectacular. We took the self-guided tour which has its advantages and disadvantages. On a guided tour there are usually a lot of people and you have to move at a certain pace. On a self-guided tour you go at your own pace often alone but if you have a question there is no one to answer it so it’s a toss-up! 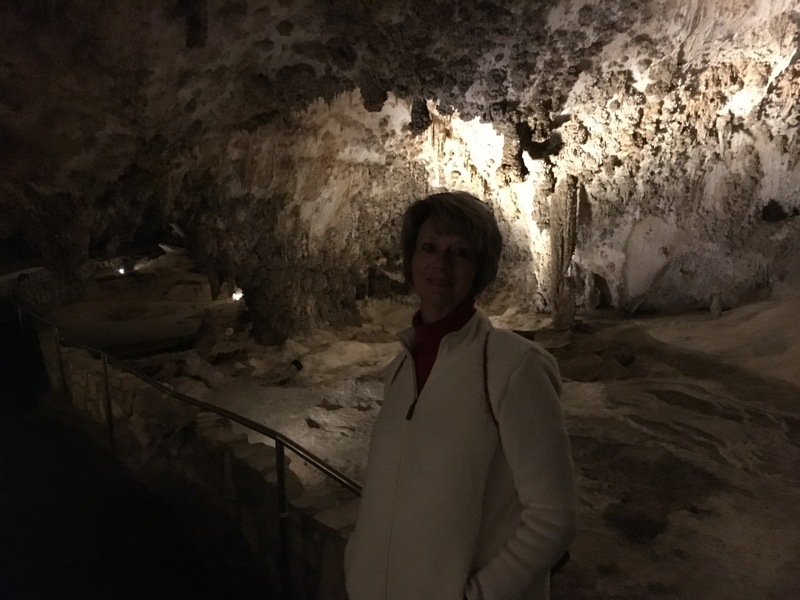 We enjoyed the self-guided tour and took our time walking the mile through the Great Room which is the largest known natural limestone chamber in the Western Hemisphere. Floor space is estimated to be more than 600,000 square feet which is comparable to 14 football fields. It is so massive with stalactites, stalagmites, columns and other speleotherms, (a term that encompasses the stalactites, stalagmites and other cave deposits made chiefly of calcite), everywhere. During the very middle of the tour it turned to more massive borders and huge rocks rather than the stalactites and stalagmites but then reverted to them nearer the end. There is an undeveloped section of the cavern called the Lower Cave consisting of more than one mile of surveyed passages. The Lower Cave and other undeveloped passages are being preserved in their natural state for scientific study. In fact, they are still discovering new passages and rooms! 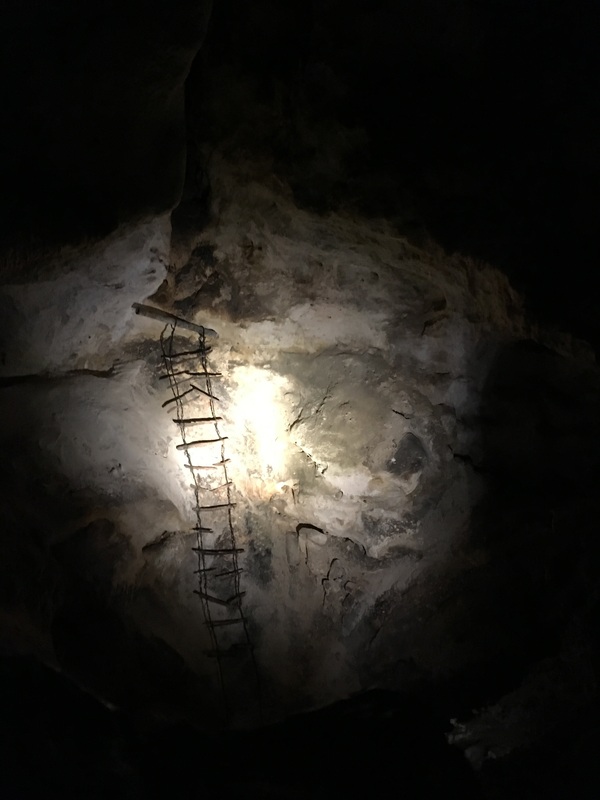 In 1924 there was a six month exploration and a cave guide built a wire ladder that descended 90 feet into the Lower Cave but explorers felt uneasy dangling in the dark pit on that ladder. Can you just imagine? After the tour we stopped at a local group of stores at the entrance and just wandered around. 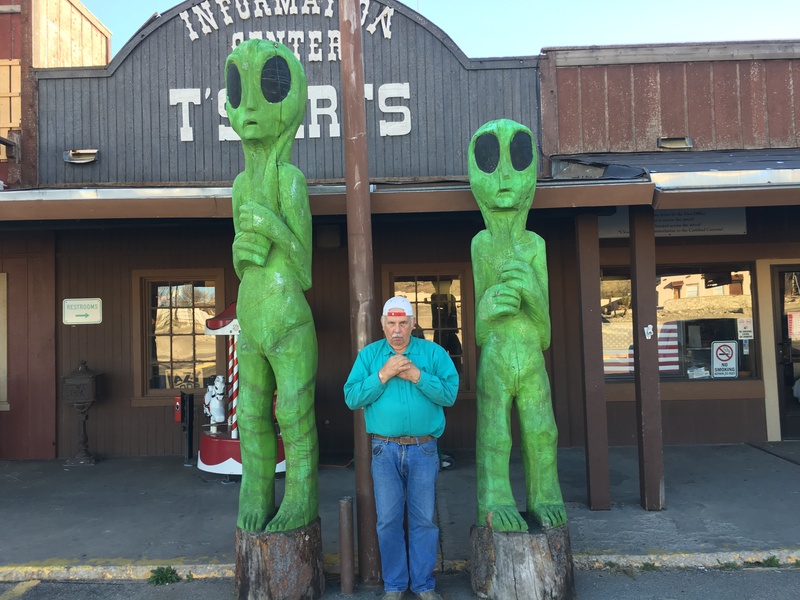 Jerry got his picture taken with the aliens! Our next stop was the local Walmart to pick up some groceries. We couldn’t decide what we wanted for dinner so we decided that we’d go out and get the pizza we tried to get on Saturday but first we had to take the groceries back to the RV. On the way back into the park Jerry suddenly slammed on brakes and there on the side of the road was a long horned cow contentedly grazing. There were two cows on the other side of the road as well. Jerry had seen them earlier and realized that there was no fence to be seen although there are a couple of cattle guards. Do the cows just roam free? We got to the campground, put the groceries up and turned around and headed back to Carlsbad for pizza. On the way out we were going very slowly looking for cows! I thought we had passed the area where we had seen them but nope, suddenly again, there he was. We stopped so I could get a picture. The cow started to walk off and then he just turned around and looked at us. We made note of where he was so we could be more careful there when we returned. Of course we knew there was no guarantee that he’d still be in that area later. We’ve seen more animals here than anywhere else including Big Bend. The park is hopping with jackrabbits plus as we were leaving Carlsbad Caverns we saw a herd of deer. I thought they looked a bit different and realized that they are long eared deer, quite different from the deer we see in North Carolina. We went to the Pizza Inn and got the buffet, nothing fancy or regional but good and filling. We drove very carefully on the way in to Brantley Lake but saw no cows! Whew! Now what to do? It’s 7:15 mountain time, 8:15 central time and 9:15 eastern time. We want to get up and be out of here by 8:00 mountain time but what time do we go to bed? Needless to say we’re confused!